Video Of The Puppies Below! Zinfndel Labradors currently has an 8 month old female available to an approved home. Litters Sired By Our Boys Check back for updates. Thank you for your interest in a puppy from Zinfndel. We believe in puppies being reared properly. Litters are born and nurtured in our home. We spend a lot of time, during the first eight weeks, handling and exposing puppies to different stimuli, new experience, and people. Each and every puppy receives a lot of love, playtime and attention. Our puppies are socialized, current on vaccinations, de-wormed, and micro-chipped before they go to their new homes. We take the same care in placing our puppies in pet homes as we do in conformation or competition homes. 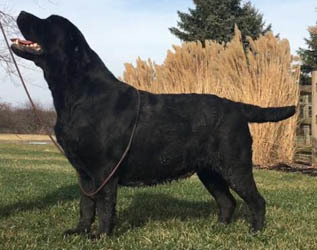 Our pups are versatile, make lovable, loyal companions and can compete in obedience, conformation, and agility and of course make great hunting companions. At times we have older puppies and adults to place in pet homes. We love to hear back from our extended Canine family to see some of our family visit our Facebook page. Some of the techniques we use to get our puppies ready to go to their new homes are with programs such as Rule of Sevens and Super Dogs........Techniques such as these go a long way toward producing an outgoing, confident adult. The U.S. Military developed a program in the 1970's called "Bio Sensor." 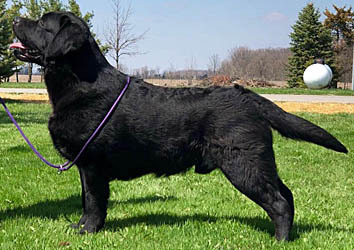 (Became publicly know and is often referred to as the "Super Dog" Program or Bio-Sensor Training for Dogs.) The program was developed to improve the performance of dogs used for military purposes. The basic premise of the program is that early neurological stimulation exercises could affect the performance of the dog. The Army's research revealed that early stimulation of the puppy from the 3rd day through the 16th day influence rapid neurological growth and development. Bio-Sensor is practiced by Zinfndel Labradors. We incorporate the Bio-Sensor or Super Dog Program into our puppy socialization development regimen. The Bio Sensor program easily fit into our established puppy rearing process and supports our Values. We do not substitute the Bio-Sensory Training for Dogs for socialization and handling of our Labrador puppies. The Bio Sensor method is a well-documented puppy development tool. Many puppies bred for field, security, and guide work are introduced to the Bio Sensor Program as part of their development. Pat Hastings, AKC judge and author of The Puppy Puzzle offers these hints for socializing very young puppies. All contents of this site copyrighted 2010-2015 Zinfndel Labradors. All Rights Reserved.